It could be the best place to start with the Red vs. Blue universe, or it could be the worst, but one thing quickly becomes apparent with Red vs. Blue: Season 14, the creators had a lot of fun making it. Unlike the long narrative of the Chorus trilogy previously released in the UK, Season 14 is an anthology, a collection of short form stories that offer bite-sized morsels of Red vs. Blue humour, this time told in a variety of animation styles. That’s ideal for a first timer, you might think, but then there is the issue of those stories that make reference to Seasons 1-10, which haven’t been released in the UK. Click on the review to see just where this release ends up. From the Chambers Combined Dictionary Thesaurus (partial), published 1995. Testament – proof, evidence, or tribute. Of – used to show origin, cause, or authorship. Sister – a female child of the same parents as another. New – recently made, bought, built, opened, etc. Devil – the most powerful evil spirit; Satan. Burst – to break open or into pieces, usually suddenly and violently. 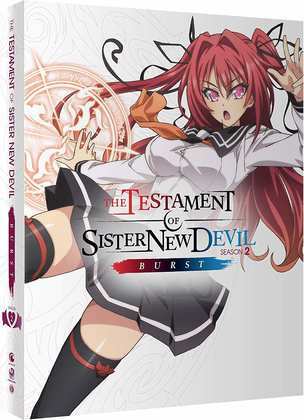 Put it all together and you have a series I will go to ridiculous lengths to avoid talking about twice, which is why I’m just linking to my review of Testament of Sister New Devil BURST. 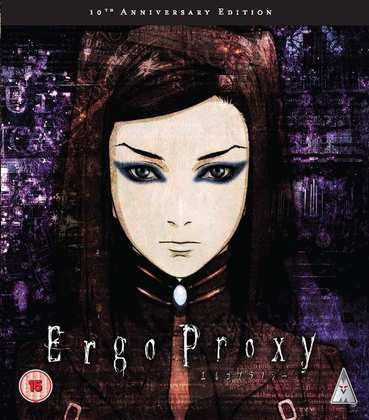 No such issue with Ergo Proxy, a show that I love to watch, and am quite happy to talk on and on about. I finally took a look at the Blu-ray release of the series, and I was very much a happy bunny. It’s from that period when anime were still being made in SD resolution, but Ergo Proxy was an early show that was in HD, and with a native surround audio track. Its brilliant dystopian sci-fi is by turns thought-provoking and entertaining; it’s as if someone gave Texhnolyze a happy pill, and it has a cast of memorable and striking characters. 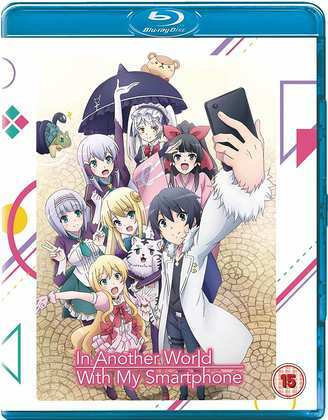 I wasn’t expecting much from In Another World With My Smartphone, after all the title does little to inspire, while the story is yet another take on the ‘lost in a parallel world’ genre that seems so popular these days. But despite this, and despite some rather flat animation, the show turned out to be a pleasant surprise, entertaining with its harem comedy antics and cast of likeable characters. Patlabor the Movie. Ah, the giant robot series that I can get behind, where the robots are realistic, and meaningful, and apart from one particular character, not anthropomorphised in any way. The series was a great deal of fun, Mamoru Oshii in between the zaniness of Urusei Yatsura and the philosophy of Ghost in the Shell, still played heavily for laughs, with a likeable character ensemble; the men and women of SV2, the Patrol Labor division of the Tokyo police, who drive their giant robots to work. The first movie spin-off raises the stakes, with a malware infested operating system threatening to drive the robots out of control. But with one plot arc with a couple of detectives investigating the programmer of the system, the film takes on a measured and melancholy air that certainly presages Ghost in the Shell. Patlabor has had a long and interesting ride in the UK, especially when it comes to the movies. Originally released by Manga Entertainment, you might be able to find the twin pack DVD second hand. Then the licence fell to Bandai and Beez, and the films got r-mastered, with new sound mixes, and a new English dub. Beez released them as jaw-dropping Special Editions in the UK, and looking on Amazon I see that they aren’t as sold out as I thought they were, although you do have to pay through the nose. Beez also released them as standard DVDs, and those too are rare and expensive. What we need are the Blu-ray releases, but those are US exclusive, and locked to Region A. Here’s my review of the first movie. 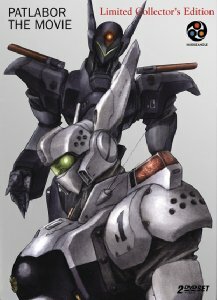 The films deserve a UK re-evaluation, but Patlabor has never performed spectacularly well in the UK, and I guess distros are twice-shy. 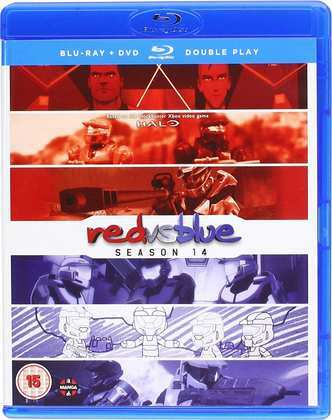 Manga Entertainment released Red vs. Blue Season 14 on Blu-ray/DVD combo on 8th October. All the Anime released Testament of Sister New Devil BURST on Collector’s Edition Blu-ray and standard DVD on 29th October, as did Funimation with their BD/DVD combo of In Another World With My Smartphone. MVM released Ergo Proxy on Blu-ray in 2016, to complement their existing DVD release.